What if you ran your life like a successful CEO runs a multi-million dollar business? The PRISM program guides you through evaluating and improving every area of your life with the clarity of an MBA in Happiness. Imagine getting area of your life aligned with your highest values, life purpose, and revamp your career in the "flow" of your ideal lifestyle. And, if you run your life using this system, you double your income and double your happiness? You will have the option of working directly with Bart Baggett as your changing habits, encouring you to take action, and support you with executive level tools and processesed previously reserved for only the C-Suite Executive with a 7 figure salary. Have a conversation with our office to discover which consultant personality type and experience fits you and your needs. If you are interested in learning more, simply set up a PRISM strategy sesssion with our team to see if this program is a good fit for you. The first step is to book a free call with one of our team members to learn more about our Prism Life Design Coaching Program. 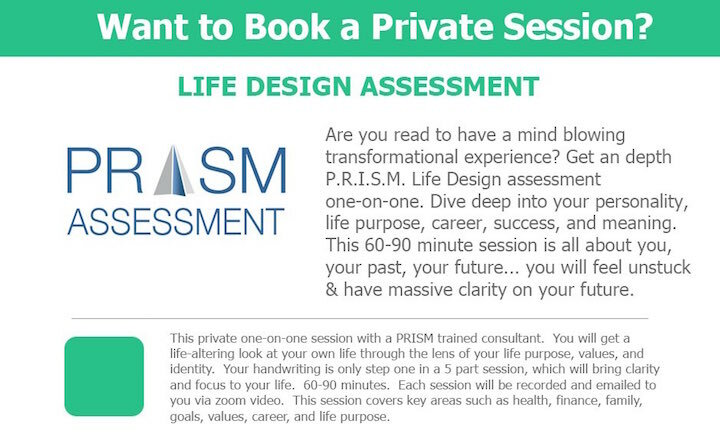 Learn more about the Prism Life Design 6-12 month personalized Life Transformational Coaching and Certification Program. Interested in having a conversation to decide if this program is right for you? out directly to us and we will recommend a Certified Life Design Consultant in your area. Go Questions? Go here to book an appointment with our international PRISM office to ask questions or simply book your private consultation using the phone number on this page. We service clients worldwide and you can be anywhere in the world. 'Yes, - I'd like to book an apppointment for my own P.R.I.S.M assessment right now. I undertand that this website does not take payment. I will talk directly to my PRISM consultant and choose a time and date. I will then fill out a short questionaire in my own handwriting before the session. Experts and find out if this is right for you. please visit this other page and submit a short application for the next Class or call our US or India office today and get your application submitted before the deadline. Call our office with questions to book your appointment. to ask questions about our live events or programs. Call the Indian / Asia Office and talk to Pooja about enrollment.